Kim Sikora: In your statement for “Delta Unknown,” you speak about the traditional and alternate sides of the word “solitude.” Can you talk a bit more about this? Jun Takano: Well, I am a Brazilian born and raised in São Paulo. In Brazil, the word solitude has a negative meaning… The Latin people that very warm and sociable therefore they always seek to be around people. In Brazil, solitude has almost the same meaning of loneliness, therefore, when you say you feel solitude, usually you are sad and lonely. I realized that, sometimes, solitude could have a different meaning, something less negative. Every now and them I just want to be away from people and be quiet enjoying the sunset for instance… It is the serene feeling we sometimes want to feel. That is what I wanted to portray in my series. KS: How did you create the concept for this series? JT: The whole concept of my series started by me being homesick. … That is when I found the Delta, which in many ways reminded me of the countryside city of Tupã (Brazil), where my grandfather lived. … Therefore, the Delta triggered so many childhood memories and became my home away from home, somewhere where I could feel some comfort. It became my meditation place. KS: Your images in this series have an ethereal quality to them. Can you talk a bit more about your experience of solitude, and your methods of photographing these with a 4×5 camera? JT: It was a humbling experience to spend hours at night shooting for my project. The time of day I choose to shoot, helps to create this ethereal mood because of the absence of people. In many nights I felt I was the only person out there. The 4×5 camera helped me slow down and to feel the place before I start shooting, this helped me to have a better emotional response to my subject. My methods to shoot with a large format camera at night are very meticulous. I had to carefully meter the scene, slowly compose and focus my shot, take many a Polaroid test shots, wait for hours to get my exposure. KS: For those unfamiliar with the area. can you talk about the residents of the Delta area? 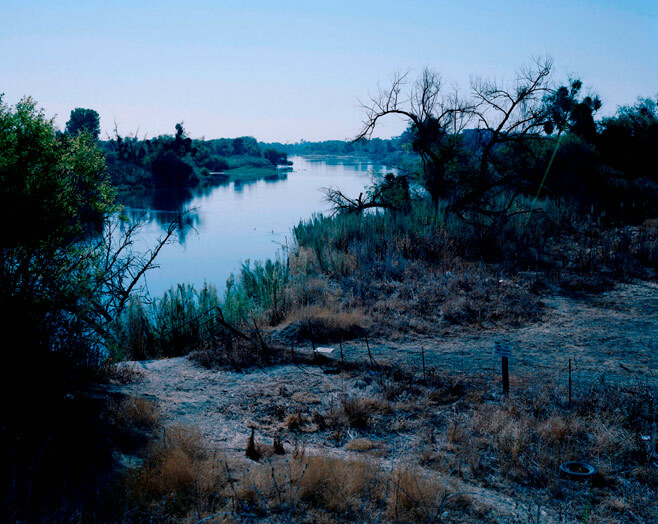 JT: To me is very hard to talk about the residents of the area, I had covered a wide range of the Delta so there were lots of different cities I shot. However I can tell that they all have one thing in common, they are usually humble and nice. During the day they are usually sympathetic people, at night this might change a little bit because to them I am the weird guy with a big camera pointing at their business and houses, so they can get a little wary about my presence. However, I have never had a problem with violence or something like that, they are usually curious and want to know what I am doing at 3 am in the streets or they just call the cops to check on me. KS: What is one thing you want your viewers to walk away from your photography with? JT: I want the viewer to have some kind of emotional response to my photographs, even if it is completely different than my own response. We all have different backgrounds and grew up in different scenarios, therefore any feeling or memory my images trigger will make me happy. In addition, I would like people to understand the need of taking care of our environment, to respect what we have around us. KS: Another great facet of this project is the color in each image. Can you explain what kinds of post-processing you do, if any? JT: To be honest, there is not much I do in post processing. The fact that I use film already helps me with all those colors, film handles colors and highlights differently than digital, especially at night. When I am scanning my negatives I usually choose one light source and I try to make it as close as I saw it when I was shooting. I neutralize one light source but I am aware that the others will shift and get some nice different colors. JT: I am working in a daytime project of the Delta right now. I really love this place. The majority of the photos are being shot at daytime from a boat. It is much more like a street photography; I am shooting different things I can capture from a boat’s view. But it is still in the beginning; there is a long way to go before it gets ready.